Few military officers ever command international coalitions in combat operations. Fewer still do it twice. General (retired) David Petraeus commanded coalition forces in Iraq from February 2007 to September 2008, and in Afghanistan from July 2010 to July 2011. These two theater commands stand in a sustained sequence of command experience: in Iraq, as Commander of the 101st Airborne Division in the drive to Baghdad and in Mosul from 2003-04, and then as Commander of the Multi-National Security Transition Command from 2004-05, responsible for developing the Iraqi Security Forces; as Commander of U.S. Central Command 2008-2010, responsible for operations across the Middle East; and finally, as Director of the Central Intelligence Agency until 2012. 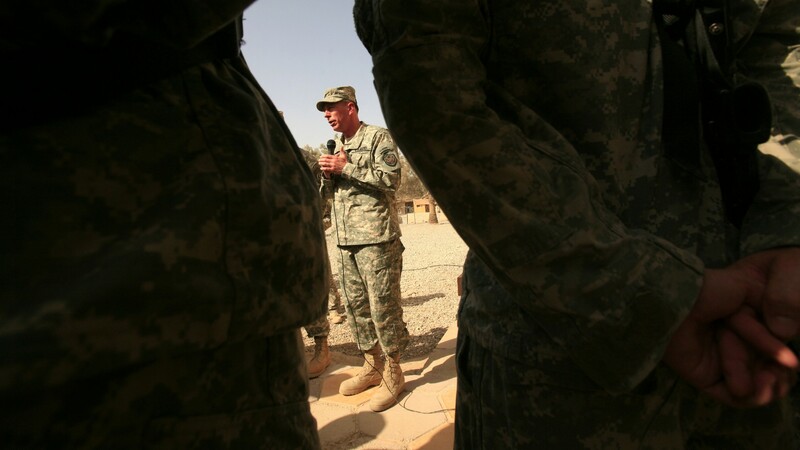 This project, run by the Belfer Center of the Harvard Kennedy School, aims to distill from the depth of General Petraeus’ experience his views on the role of the theater level commander, specifically from the perspective of strategic leadership: the link between policy and operations. Conducted over the 2014-15 academic year, the project team worked with General Petraeus to draw out his views on strategic leadership in several interviews. The filmed version represents a distillation of this interaction. We are fully aware that the vantage point of 2015 is one of (relatively recent) hindsight, which brings advantages and disadvantages, and that events in Iraq at this moment give us an additional perspective. "The President started out by saying, with no small talk, “I am asking you, as your President and Commander-in-Chief, to take the position in Afghanistan and to become the commander of the International Security Assistance Force.” And... the only answer to a question like that has to be yes." "Strategic leadership is that which is exercised at a level of an organization where the individual is truly determining the azimuth for the organization, is actually charting the path. And you have one person like that, certainly in a military organization, and typically it’s the commander... He’s the one, again, that is developing the direction that the organization is going to go. And again, in essence there are four tasks. The first is to get the big ideas right. The second is to communicate them effectively throughout the breadth and depth of the organization. The third is to oversee the implementation of the big ideas. And the fourth is to determine how the big ideas need to be refined, changed, augmented, and then repeating the process over again and again and again." "When I was done that day I actually... put my head down on the desk for a moment and thought to myself, “Why in the world had I taken this on?” It was a pretty desperate situation. Levels of violence were catastrophic. The month that the president decided on the surge I think there were fifty three dead civilian bodies due to violence every twenty four hours in Baghdad alone. That was what greeted us and that was the context in which we implemented the surge." "On arrival in Iraq I was summoned by the National Security Advisor [of Iraq]... and he levied a series of demands that he said were voiced by Prime Minister Maliki and which were essentially the opposite of everything that we intended to do in the surge. It was, once again, get out of the cities, consolidate on big bases, hand off to Iraqi forces faster, release detainees, reduce night raids, again 180 degrees different from what we intended to do and were starting to implement. And that is where I think you have to be quite seriously straightforward, and I was. I said Dr. Mowaffak al-Rubaie... if this is truly what the prime minister wants and is going to direct, I think he probably should communicate that to President Bush in his regularly scheduled video teleconference. I’ll be sitting in on it with him, as is customary with the ambassador, but he should know that if he does that he will implement that without me, because I’ll be on the next plane to the United States and I intend to take the policy with me. That was about as direct as it comes. There were only one or two other cases in which that kind of threat had to be put on the table, and indeed I never heard anything about those demands again, although I was sweating bullets in the video teleconference the next day." "Every single day we had the battlefield update and analysis... at the end of which we had a small group meeting with a select group of the highest, most senior coalition leaders, and then ultimately a smaller group with just U.S. and UK, and then perhaps the smallest of the small groups, which was just Lieutenant General Odierno and me sitting there looking at each other asking when each of us thought this thing was going to turn in the early, very, very tough days." "We had a riot one night early on in my time in command where there were some 10,000 detainees rioting. And there’s no fence in the world that can stop 10,000 detainees if they all work together. And we ended up mustering every single person at that particular camp, in riot control gear, with the fire engines and everything else we could. Every non-lethal munition we had, shot thousands of rubber bullets that evening, before finally getting it under control. And I realized something was seriously wrong. The new detainee joint task force commander had just taken over, and we underwent a very systematic assessment and we came up with a number of big ideas for detainee operations." "One time a major told me, he said “Hey sir, you know we’ve got this particular development in our area, this one bad guy has already—all of a sudden decided that he wants to oppose Al Qaeda and he wants our support but folks are really nervous about it.” And on the spot I said, “You support him, you get after it, I’ll take care of the chain of command between you and me and the Iraqi leadership. But you go back, tell your battalion commander, ‘Don’t let our bureaucracy stand in the way of supporting this individual.’ You put him in the backs of your tracked vehicles, your fighting vehicles, you give him ammunition, you give him supplies, but help him, and again, I’ll make sure--I’ve got your back." "There are people over the years that said Petraeus was lucky. He got a break here and there and gosh he gets thrust into this situation and the country’s committed and he’s lucky and fortunate enough to be in that position. And there’s a lot to that. Again, life is about luck and timing, about being at a key position at a key time. And you know, there but for a year or two this way or the other, someone else would have taken the call. There’s a saying by a Roman philosopher that luck is what happens when preparation meets opportunity. And I’d like to think that I was prepared, that I had worked assiduously, hard, academically, militarily, physically, whatever it may be, over the years to be ready if the call came."